What is/are your in-game name(s)? Joran. I have a couple of aliases, the ones I use the most are Earl, p1nhead, xvvii, Pharrell, Ph and sometimes I use some random spontaneous names. In what country and time zone do you live? I'm from the Netherlands, and the time zone is UTC/GMT +1 hour, IIRC. How long have you been playing Sauerbraten? I started playing Sauerbraten in 2010. Have you been in any clans before? Do you have TS3 and a mic? I have TS3 installed on my PC and I have no problem using it to communicate during inter games or clan wars, but if we're just chatting around I'd rather use IRC. What are your favourite maps and gamemodes? 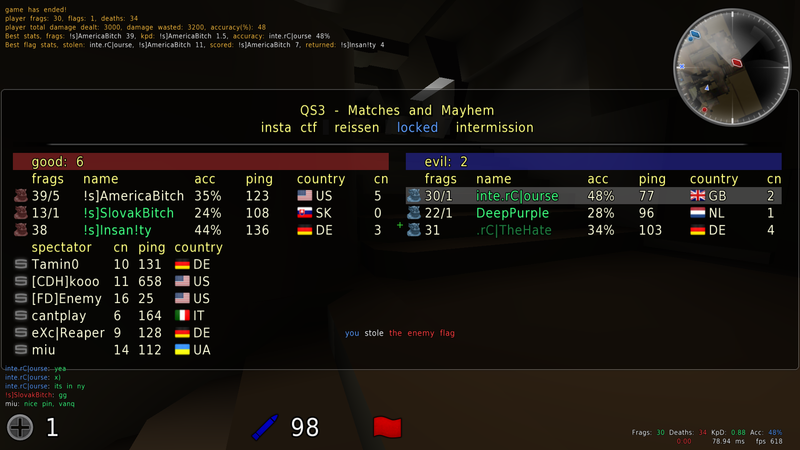 I like the capture the flag based modes on wdcd, reissen, dust2, forge and capture_night. Do you have an authkey? I do have a globalauth key, as “joran”. So yeah, I decided to write an application for rC basically because I believe you're an amazing team with good players and nice people to chat with. I think that's really important when you're in a clan together. 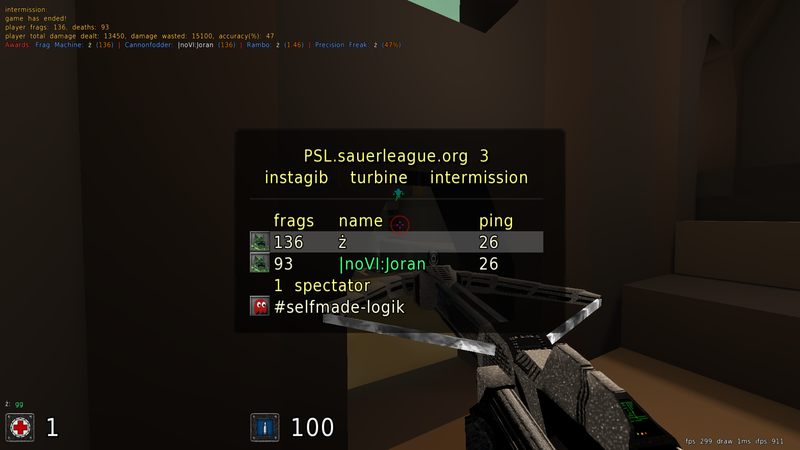 I also see great potential for rC to become one of the stongest clans of Sauerbraten sooner or later. I'd love to be part of a new, skilled clan. Within about three weeks you've grown a lot already. You got some amazing players! I think rC will really make it to the top, and I'd love to help with that. I know TheHate from the Trooper edition where I've played with him a lot already, glad to see he's back! I'd like to get to know you all. I've already done some games with most of the members. I think I can learn a lot from you, especially on the effic based modes. I really like the effic based modes, but it's just that I'm "grown up" with instagib but I'm sure I you can teach me anything about effic. Well, in case I forgot mentioning something, or if you'd just like to know something about me, ask away! I'm on IRC most of the time, so it won't be a problem to catch me there. I'm always up to do a clan war as well! PS: I'll also post some screenshots later. 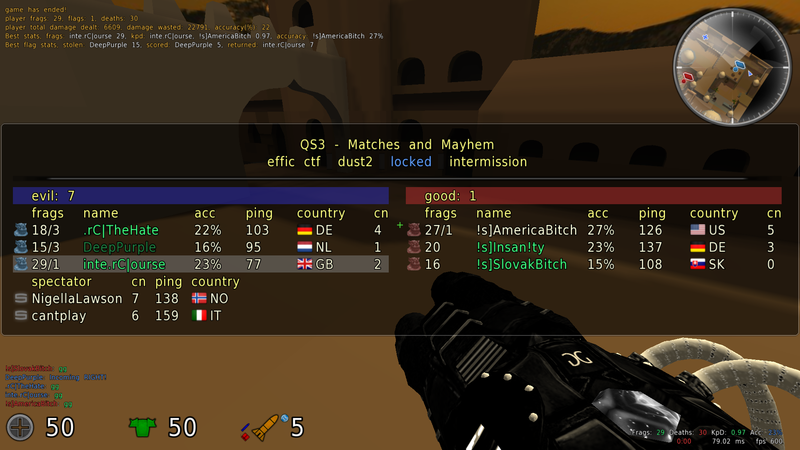 We already played some games together and u seem to be pretty nice especially in ictf mode. U also seem to be a really gentle person, which is important to be part of a clan. Looking forward to some nice games and wish u good luck with ur application! 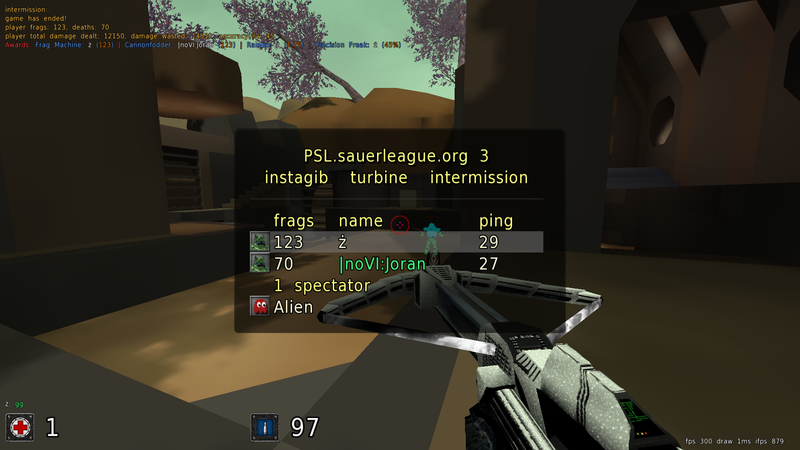 I duelled Marti on instagib turbine today. The score was 119-60, IIRC. I lost the screenshot because I take pictures as /screenshot Ph when with that name but I didn't realize they automatically replace each other. to you or to him? We played a couple of matches some weeks ago. Yep. Thanks for posting, Acuerta. GGs! Ok, I got TS3 running. I don't have a microphone yet though, but at least I can hear you during the clan wars.